Product Condition: The ZX/3 Classic Sandal - Women's is in Excellent condition. These sandals were previously owned for three weeks. The following observations were made regarding these item. *They were lightly used for an occasion. *There aren't any defects in them at all. *They got dirty on the soles, cleanable. *All items sold as is, all warranties void. 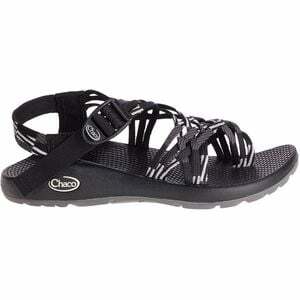 Designed with a triple-strapped upper, the Chaco Women's ZX/3 Classic Sandal offers striking style to match its legendary support and cushioning. Eight solid component parts ensure reliability across a wide range of terrain, from surf-washed shorelines to lush jungles. The triple-strapped webbing creates a custom fit without slippage, thanks to its pull-through strap adjustment and sturdy ladder lock buckle. Offering unsurpassed grip in wet conditions, the textured polyurethane footbed keeps your foot from sliding around once it's damp. The LUVSEAT midsole cushions every stride across rough terrain with its ergonomically shaped foam. Another key component to the sandal's unflappable poise is its ChacoGrip rubber sole. This rubber sole stands apart from the competition with aggressive lugs, which supply unrelenting traction across wet surfaces and rocky trails.